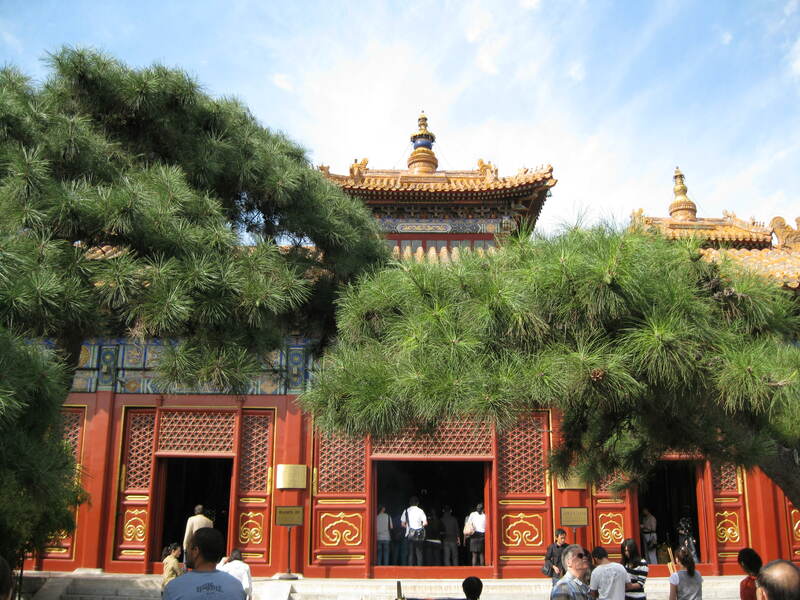 Things to write about: the Lama Temple. Table Tennis. A difficult week. A wonderful time at church. These are some of the things I reminded myself to update. About two weeks ago two of our Assistant Teachers, Emma and Cecilia, took us international faculty to the Yonghe Lama Temple. (I believe I have the spelling correct.) This temple was originally a mansion, best understood as a complex of buildings, for one of the emperors during the Qing Dynasty, but was given over to be a temple. Each structure within this magnificent and fascinating assortment of buildings has and tells its own story. No doubt the most impressive sight was that of a Buddha, standing about 55 feet high (with about 25 feet below unseen as a foundation), carved from a single piece of wood. Photos are not permitted inside the buildings, as they are sacred spaces. As for table tennis, one of my students, Haddy, is ranked second in Beijing for her age group. In a fit of hubris I suggested that she and I play. Thankfully, we have not played. Instead, we have hit across the net. Not only is she an excellent player, but she is also a good teacher. What I thought might be a one-time event seems to be turning into a Wednesday lunchtime event, which I don’t mind at all, especially as a lot of other students are joining in! Not this current week, but last week, was difficult. I think many of the faculty were feeling a bit tired, and we are collectively realizing that our work here, while offering tremendous opportunities and privileges (among which is working with a stellar group of students), will also be very difficult, mostly, and not unexpectedly, due to the language barrier. Patience is the order of the day — and of the coming days. At church, my friend Chang ended up sitting next to an older, perhaps elderly, gentleman, rather unkempt, but very much at home in the church. Indeed, as Chang said, “He was very enthusiastic, and this made me a bit uncomfortable.” What she was referring to was at the sign of peace, he was not willing merely to shake hands; he insisted on hugging, and so forth. While I can fully understand Chang’s feelings, what I tried to explain to her is that perhaps this elderly man sensed in her a certain kindness, he felt able to attempt some form of human connection. (Is this man homeless? Does he have friends? I don’t know.) I further tried to explain that perhaps because of this momentary human connection, he might have left church feeling, well, a bit more human, and not so anonymous, that to attract others who may not in the eyes of the world be attractive, could in fact be a gift of mercy to a hurting world. At the end of this conversation, while Chang may not have fully accepted my attempt at an explanation, she did say that she wished she could think similarly. Right about this time we then were visited by my favorite book seller from the Foreign Language Bookstore, Cheng Wei, and then later on one of the expat priests from the parish, who is from Queens in NYC. We all had a brief time of merry, animated and fruitful conversation, with everyone going away feeling a bit better about themselves and the world around them. All good. To follow: the electron stream, traffic rules as a variation on Schrodinger’s Cat, and Thomas Paine visits Beijing No. 2 Middle School. So many adventures and memorable moments! It will be interesting in 3, 6, 12 months to look back at these early days and see what has changed and what has remained the same.